Caspases are a family of conserved intracellular cysteine-dependent aspartate-specific cysteine proteases that play important roles in regulating cell death and inflammation. Our previous study revealed the importance of the inflammatory caspase 1 gene in extracellular ATP-mediated immune signaling in Japanese flounder, Paralichthys olivaceus. 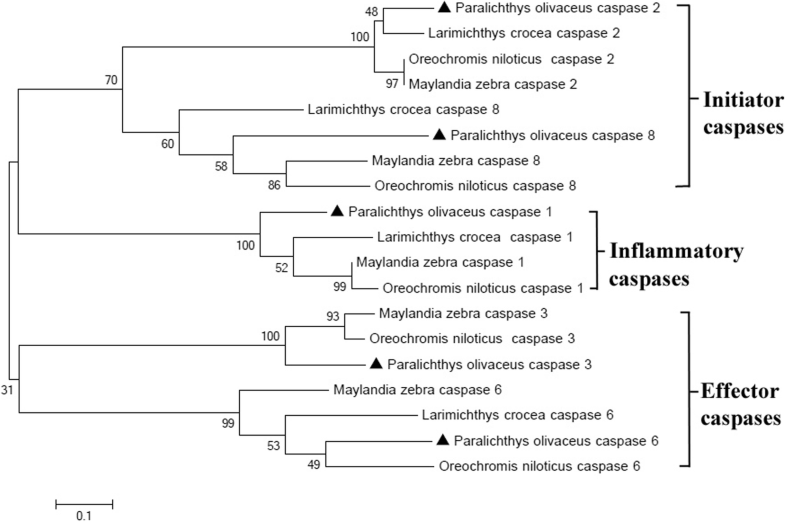 To explore the potential roles of other caspases in P. olivaceus innate immunity, we extended our study by characterizing of the responses of four additional P. olivaceus caspase genes, termed JfCaspase 2, 3, 6 and 8, to inflammatory challenge and extracellular ATP stimulation. Sequence analysis revealed that the domain structures of all the Japanese flounder caspase proteins are evolutionarily conserved. Quantitative real-time PCR analysis showed that the JfCaspase 2, 3, 6 and 8 genes were expressed ubiquitously but at unequal levels in all examined Japanese flounder normal tissues. In addition, the basal gene expression levels of JfCaspase 2, 3, 6 and 8 were higher than those of JfCaspase 1 in both Japanese flounder head kidney macrophages (HKMs) and peripheral blood leukocytes (PBLs). Furthermore, immune challenge experiments showed that the inflammatory stimuli LPS and poly(I:C) significantly modulated the expression of the JfCaspase 2, 3, 6 and 8 genes in Japanese flounder immune cells. Finally, DNA fragmentation, associated with increased extracellular ATP-induced JfCaspase 2, 3, 6 and 8 gene expression and enzymatic activity, was inhibited by the caspase inhibitor Z-VAD-FMK in the HKMs. Our findings demonstrate broad participation of multiple caspase genes in response to inflammatory stimulation in Japanese flounder immune cells and provide new evidence for the involvement of caspase(s) in extracellular ATP-induced apoptosis in fish. Caspases are a family of conserved intracellular cysteinyl aspartate-specific proteases that trigger programmed cell death (apoptosis or pyroptosis) and inflammation to maintain homeostasis in organisms from worm to human beings [1–3]. The family of caspase proteins contains 14 members in mammals (caspases 1–3, 6–9, 12 and 14 in humans and mice; caspases 4, 5 and 10 in humans; and caspase 11 in mice). The major caspase proteins can be functionally classified into apoptotic caspases including the initiator caspases (caspases 2, 8, 9 and 10) and the effector/executioner caspases (caspases 3, 6 and 7), and the inflammatory caspases (caspases 1, 4, 5, 12 in humans and caspases 1, 11 and 12 in mice). Caspases are tightly controlled as inactive zymogens (also known as procaspases) and are activated following signaling events promoting their cleavage and aggregation into dimers or macromolecular complexes . The initiator caspases, which are activated by intrinsic and/or extrinsic signals, can cleave and activate the effector caspases, which in turn cleave target proteins during apoptosis, while the inflammatory caspases are primarily involved in pro-inflammatory cytokine processing during inflammatory processes  and in the promotion of innate immune responses to various internal and external stimuli . Interestingly, both the initiator and effector functions are found within the inflammatory pyroptotic caspases (caspases 1, 4, 5 and 11) . To date, several caspase genes have been cloned, including caspase 1 from gilthead seabream, Sparus aurata ; caspases 1, 2, 3, and 9 from tongue sole, Cynoglossus semilaevis ; caspases 1, 2, 3, 8, 9 and 10 from striped murrel, Channa striatus [7, 8]; caspases 3, 8 and 9 from sea bass, Dicentrarchus labrax L. [9–11]; caspase 3 from rock bream, Oplegnathus fasciatus ; caspase 6 from rainbow trout, Oncorhynchus mykiss ; caspases 3 and 9 in large yellow croaker, Pseudosciaena crocea [14, 15]; and caspases 1 and 10 from Japanese flounder, Paralichthys olivaceus [16, 17]. Previous studies have revealed the immunological significance of different caspases in fish. 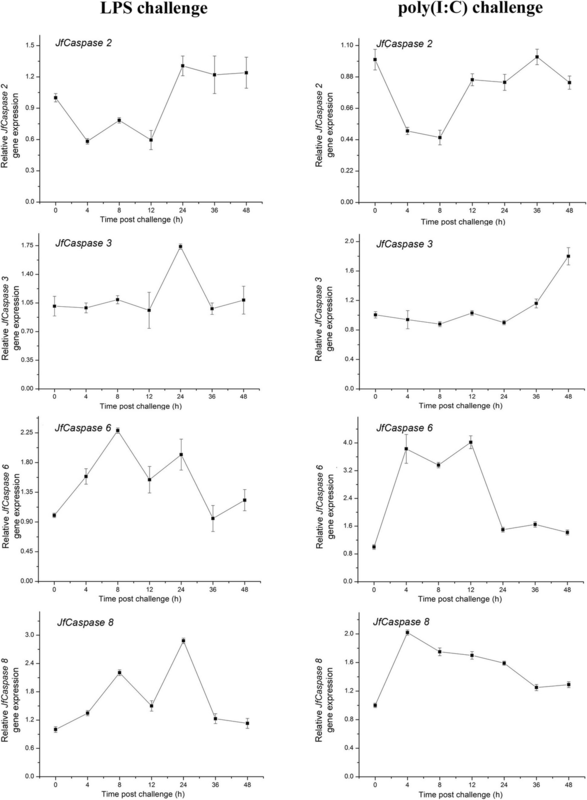 Upon overexpression of caspases in tongue sole, Long et al. found that caspase genes 1, 2, 3 and 9 are essential to optimal defense against bacterial infection in fish . Banerjee et al. reported that the caspase 3 protein mediated head kidney macrophage apoptosis during Aeromonas hydrophila infection in Clarias batrachus . In addition, the involvement of the caspases 3 and 6 proteins in apoptotic cell death during red sea bream iridovirus infection has also been suggested . Our previous studies revealed that extracellular ATP (eATP) is a potent signaling molecule in the activation of the innate immune responses in fish [20–22]. We recently identified and characterized a caspase 1 gene (namely, JfCaspase 1) in Japanese flounder, P. olivaceus, and showed that eATP can rapidly upregulate JfCaspase 1 gene expression and enhance its enzymatic activity in Japanese flounder immune cells, suggesting the involvement of caspases in eATP-mediated immune signaling in fish . In this report, we identified and characterized the responses of four additional caspase genes, termed JfCaspases 2, 3, 6 and 8, to inflammatory stimulation in P. olivaceus immune cells. We also investigated the gene expression patterns and enzymatic activitiy induced by eATP stimuli. Our findings revealed that inflammatory stimuli, as well as the important danger-associated signaling molecule, eATP, have a broad effect on the gene expression of multiple caspase family members in Japanese flounder immune cells. In particular, we showed an association of eATP-induced DNA fragmentation with increased JfCaspase 2, 3, 6 and 8 gene expression and enzymatic activity in Japanese flounder immune cells. Our findings suggest that caspase(s) may play an important role in eATP-induced apoptosis in fish. The experimental fish P. olivaceus were obtained from a local fish farm in Tianjin, China. Fish were maintained in an aerated running sea water system in the laboratory for two weeks before experiments. Only healthy fish without any pathological signs were selected for experimentation. To collect tissue, fish were euthanized with 0.25 g/L tricaine methanesulfonate (Sigma-Aldrich); blood were collected and tissues including the gill, head kidney, trunk kidney, heart, liver, skin, muscle, intestine and spleen were dissected from individual healthy Japanese flounder under sterilized conditions. Samples of the same kind of tissue from five individual fish were pooled, and total RNA was extracted (see below) to analyze the basal tissue expression of Japanese flounder caspase genes by quantitative real-time PCR (qRT-PCR). Total RNA from cells and tissues was extracted using a PureLink® RNA Mini Kit and TRIzol reagent (Invitrogen), respectively, according to the manufacturer’s instructions. The integrity of the purified total RNA was examined with a 1.5% formaldehyde denaturing agarose gel. Then, the RNA was quantified by a NanoDrop spectrophotometer and treated with DNase I (Invitrogen, amplification grade) to remove genomic DNA contaminations following the protocol specified by the supplier. First-strand cDNA was then synthesized using a SuperScript III reverse transcriptase kit (Invitrogen) according to the manufacturer’s directions. The entire coding regions of the JfCaspase 2, 3, 6 and 8 cDNA were amplified from Japanese flounder spleen or liver tissue using Platinum™ Taq DNA Polymerase (Invitrogen) with the primer pairs listed in Table 1, which were designed based on the available Japanese flounder JfCaspase 2, 3, 6 and 8 cDNA sequences (GenBank accession numbers: XP_019948600.1, AFC60626.1, XP_019956800.1 and XP_019955218.1, respectively) in the GenBank database of the National Center for Biotechnology Information. The PCR products with the expected sizes were purified with a GeneJET Gel Extraction Kit (Thermo Fisher Scientific) and cloned into a pMD18-T vector (TaKaRa) for DNA sequencing. The obtained nucleotide and protein sequences were searched against the GenBank database using the BLAST program (http://www.ncbi.nlm.nih.gov/) to determine their sequence identities. The deduced amino acid sequences of the JfCaspase 2, 3, 6 and 8 genes were translated using the ExPASy Translation Tool (http://www.expasy.org) and showed 100% sequence identity with their respective reference sequences in the NCBI database. Multiple sequence alignment was performed using the Clustal Omega program (https://www.ebi.ac.uk/Tools/msa/clustalo/). The protein domain structures were searched in the Conserved Domain Database (https://www.ncbi.nlm.nih.gov/cdd). The percentages of amino acid sequence identity were calculated by pair-wise alignments at the NCBI website with the default settings. A neighbor-joining phylogenetic tree was constructed based on the multiple sequence alignments using MEGA 5.0 software with the number of bootstrap trials set to 10,000. The procedure for the preparation of Japanese flounder primary head kidney cells was described previously . Peripheral blood was collected from the caudal vein of Japanese flounder (average 800 ± 50 g) with a 10 ml heparinized syringe. The obtained primary head kidney cells and blood cells were then used to isolate the head kidney macrophages (HKMs) and peripheral blood leukocytes (PBLs), respectively, by discontinuous Percoll gradient centrifugation with a previously described protocol . The viability of the isolated cells was examined by trypan blue exclusion assay. Then, the HKMs and PBLs were cultured in RPMI 1640 medium (Invitrogen) supplemented with 10% FBS and 1% penicillin-streptomycin liquid (Invitrogen) at 21 °C. The relative basal gene expression levels of JfCaspase 2, 3, 6 and 8 in Japanese flounder normal tissues and immune cells were determined by qRT-PCR analysis. Briefly, Japanese flounder tissues, including blood, gill, head kidney, trunk kidney, heart, liver, skin, muscle, intestine and spleen, were collected from five healthy Japanese flounder (average weight 500 ± 20 g). Each kind of tissue was equally pooled to avoid individual variation, and the pooled samples were used for RNA purification. Total RNA was purified, digested with DNase I and transcribed into cDNA as previously described. The relative gene expression levels for the individual JfCaspase gene were determined by qRT-PCR (see below) with beta-actin serving as an internal reference gene. In vitro immune challenge experiments in Japanese flounder HKMs and PBLs with the pathogen-associated molecular pattern molecules LPS and poly(I:C) were detailed in a previous study . Briefly, overnight-cultured Japanese flounder HKMs and PBLs (5 × 106 cells/well) were treated with 20 μg/ml LPS or poly(I:C) (final concentration, dissolved in cell culture medium, Sigma-Aldrich) for 4, 8, 12, 24, 36 or 48 h. Cells without PAMP treatment served as the controls. After treatment, total RNA was purified and transcribed into cDNA, and LPS- and poly(I:C)-induced changes in JfCaspase 2, 3, 6 and 8 gene expression were measured by qRT-PCR. To explore the responses of JfCaspase genes to eATP treatment, Japanese flounder HKMs (5 × 106 cells/well) were stimulated with 1 mM ATP (dissolved in cell culture medium) for the indicated durations. 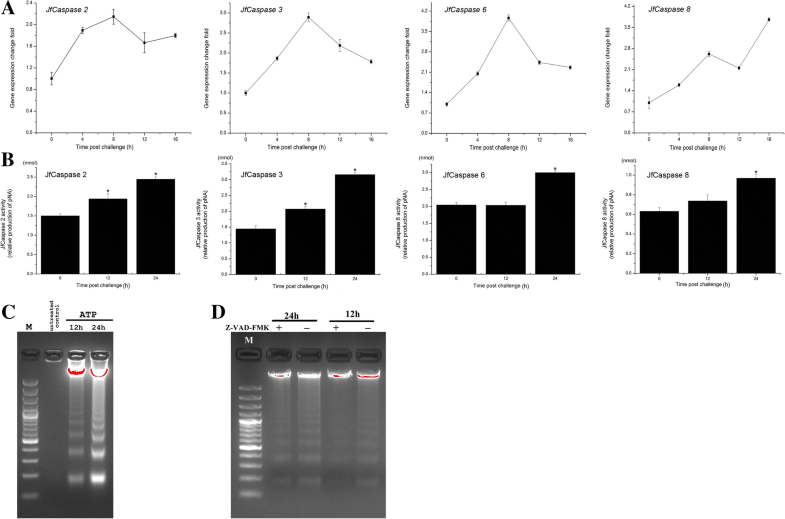 eATP-induced JfCaspase 2, 3, 6 and 8 gene expression changes compared with the expression in the untreated controls were measured by qRT-PCR. The eATP-induced JfCaspase 2, 3, 6 and 8 enzymatic activity in the HKMs was determined with their respective enzymatic activity assay kits (Beyotime Institute of Biotechnology, China), according to the manufacturer’s directions. The eATP-induced enzymatic activity of the JfCaspase 2, 3, 6 and 8 proteins is presented as the change in their respective substrates (Ac-VDQQD-pNA, Ac-DEVD-pNA, Ac-VEID-pNA and Ac-IETD-pNA, respectively) into the yellow formazan product p-nitroaniline (pNA). Briefly, the HKMs were lysed on ice for 15 min followed by centrifugation at 15000 rpm for 15 min. The protein concentrations were determined with a Bradford protein assay kit (Pierce). The supernatant, containing equal amounts of total proteins (83.7 μg), was incubated in a 96-well plate with 30μl of the respective substrates at 37 °C for 2 h. The absorbance values of pNA released from the substrates in the clarified supernatant were measured at 405 nm (OD405) by a Tecan Infinite® M200 PRO multimode microplate reader (Switzerland). Each reaction was performed in triplicate. The eATP-induced JfCaspase enzymatic activity is presented as the pNA levels, which were calculated from a standard curve. The basal JfCaspase enzymatic activity in the HKMs without ATP treatment did not show any significant differences during the experiments (data not shown). The Japanese flounder HKMs were treated with or without 1 mM ATP for 12 or 24 h in the presence or absence of pan-caspase inhibitor Z-VAD-FMK (Beyotime). After treatment, genomic DNA from the HKM cells was purified using a genomic DNA extraction kit for marine animals (Tiangen Biotech Co. Ltd., China) and treated with RNase A (Invitrogen). The same amount of DNA was loaded onto a 2% agarose gel, and DNA fragments were visualized by electrophoresis and staining with ethidium bromide. Without ATP treatment, no DNA fragmentation was observed in the HKMs during the experiments (data not shown). The relative gene expression levels of the JfCaspase 2, 3, 6 and 8 under normal conditions and different challenge conditions were determined by quantitative real-time PCR (qRT-PCR) analysis. qRT-PCR was performed on an Applied Biosystems® 7500 Fast Real-Time PCR System (Thermo Scientific) using an AceQ qPCR SYBR Green Master Mix kit (Vazyme Biotech Co. Ltd., China) according to the manufacturer’s recommendations. The primers for the detection of the individual JfCaspase genes are listed in Table 1. The amplification efficiencies of the primer pairs for qRT-PCR detection of the JfCaspase 2, 3, 6 and 8 genes were 99.39, 99.14, 103.14 and 98.98%, respectively, which were determined based on the slopes of standard curves constructed for each amplicon using serial dilutions of the respective plasmid as templates. Gene expression levels were evaluated using the comparative 2-△△Ct quantification method with beta-actin as an internal reference gene. Melting curve analysis and gel electrophoresis were performed at the end of amplification. The PCR products were further sequenced to ensure the specificity of amplification. All data are presented as the mean ± standard deviation from triplicate experiments. The results were statistically analyzed with Student’s t-test for comparison between two groups. A p value less than 0.05 was considered statistically significant. The characteristics of the Japanese flounder caspase proteins are summarized in Table 2. JfCaspase 1 encodes a 384-amino-acid protein with a predicted molecular mass of 43.7 kDa. JfCaspase 2 encodes a 459-amino-acid protein with a predicted molecular mass of 52.09 kDa. JfCaspase 3 encodes a 214-amino-acid protein with a predicted molecular mass of 23.92 kDa. JfCaspase 6 encodes a 299-amino-acid protein with a predicted molecular mass of 33.70 kDa. JfCaspase 8 encodes a 478-amino-acid protein with a predicted molecular mass of 54.33 kDa. In addition, the JfCaspase 1, 2, 3 and 6 proteins have similar isoelectric points that are close to 6, while JfCaspase 8 protein has a lower isoelectric point (Table 2). 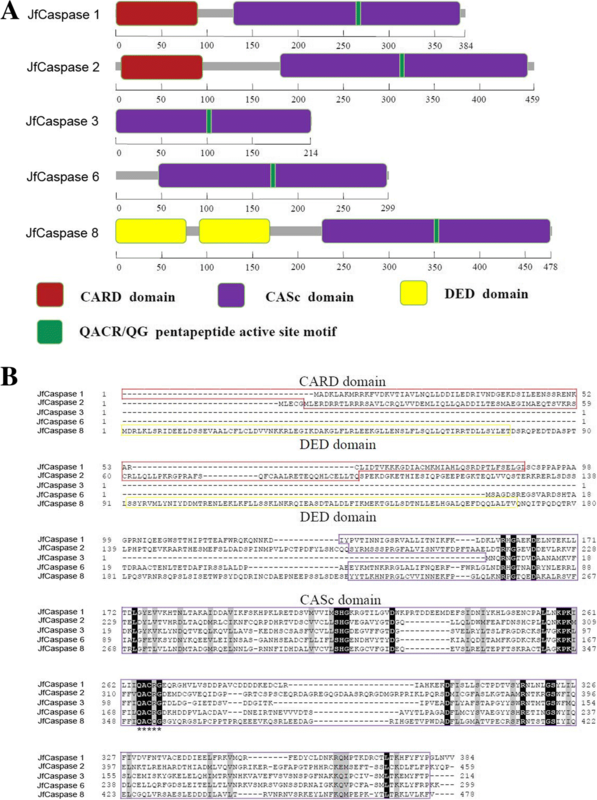 Although the JfCaspase 1, 2, 3, 6 and 8 proteins exhibit different primary peptide sequences, they share a common caspase, interleukin-1 beta converting enzyme (ICE) homologues (CASc) domain containing a caspase active site pentapeptide (QACR/QG) motif (Fig. 1), a conservative feature of caspase-family proteins . In addition, the JfCaspase 1 and 2 proteins contain an additional caspase recruitment domain (CARD), whereas JfCaspase 8 possesses two death effector domains (DED) required to signal apoptosis at the N-terminus, allowing these three proteins to complex with different adapter proteins and trigger different downstream signaling pathways. Furthermore, the JfCaspase 3 protein has an 84RGD86 motif that is involved in integrin recognition. These conserved features indicate that fish caspase proteins are structurally similar to mammalian caspase orthologs. A BLAST search against the GenBank database revealed that the Japanese flounder caspase proteins share high sequence identity with their respective counterparts from other teleost species. Comparison of the amino acid sequences among the six Japanese flounder caspase proteins, however, revealed that they share less sequence identity (the maximum sequence identity is 21%, Table 3), indicating that they may have different structural features. 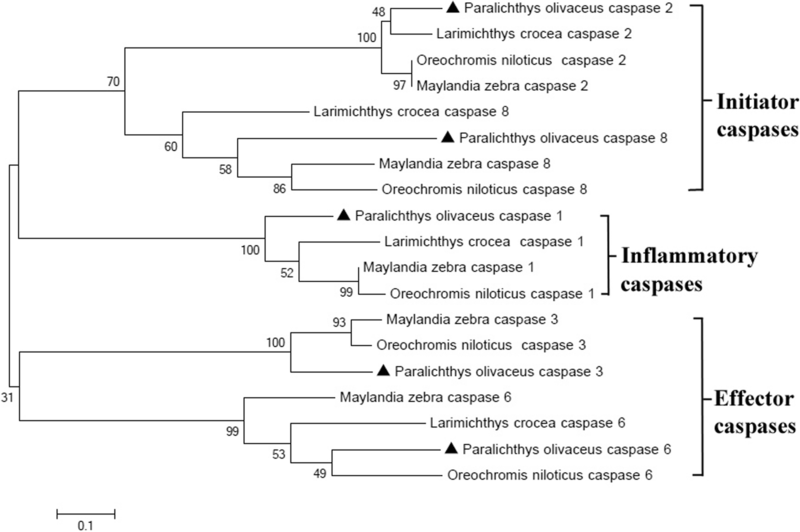 Phylogenetic analysis revealed that the selected teleost caspase proteins are clustered into three subgroups: group 1 comprises the initiator caspase 2 and caspase 8 proteins; group 2 comprises the inflammatory caspase 1 proteins; group 3 comprises the effector caspase 3 and caspase 6 proteins (Fig. 2). This finding reflects their different structural relationships. The expression of the JfCaspase 2, 3, 6 and 8 mRNA transcripts in the Japanese flounder normal tissues are shown in Fig. 3a. Caspase-family genes are widely distributed in various tissues of various teleost species [7, 9, 10, 13, 15]. Similarly, all four JfCaspase genes are constitutively expressed in all examined Japanese flounder tissues but at unequal expression levels. This finding, together with our previous observation that the JfCaspase 1 gene is widely present in Japanese flounder tissues , suggests that multiple caspase genes are required in the Japanese flounder body. However, the JfCaspase 2 gene is expressed at the highest level in the blood, followed by the skin, trunk kidney, muscle, intestine, heart, head kidney, spleen, gill and liver. The JfCaspase 3 gene is predominantly expressed in blood and skin and shows the lowest expression in the intestine and gill. The JfCaspase 6 gene is primarily expressed in the intestine, with the lowest expression in the head kidney. The JfCaspase 8 gene is highly expressed in blood but is expressed at lower levels in the spleen and trunk kidney. These observations indicate that different caspase genes are constitutively but unequally expressed in Japanese flounder tissues. Similarly, the predominant expression of the caspase 2 gene in the blood of striped murrel, Channa striatus  and the abundant expression of the caspase 3 gene in the blood of yellow croaker, Pseudosciaena crocea , have been reported previously. However, the caspase 3 and 8 genes are mainly expressed in the spleen and liver, respectively, in C. striatus , and the caspase2 and 3 genes are predominantly expressed in the muscle of tongue sole, Cynoglossus semilaevis . These observations revealed that the dominant expression tissue of a given caspase gene varies among different teleost species, suggesting that caspase genes are diversely expressed in fish. Next, qRT-PCR analysis was performed to compare the relative expression levels of JfCaspase genes in Japanese flounder immune cells. Figure 3b showed that the basal gene expression level of JfCaspase 1 was lower than that of JfCaspase 2, 3, 6, 8 and 10 in both HKMs and PBLs. This lower expression may reflect a lower enzymatic activity of the JfCaspase 1 protein under resting conditions. The relatively higher gene expression levels of JfCaspase 2, 3, 6, 8 and 10 indicates that these genes are essential mediators of apoptosis in Japanese flounder immune cells. Alternatively, they may perform nonimmune functions under unstimulated conditions. For example, recent studies have indicated that caspase 2 activity is required for correct cell proliferation . Caspase gene expression can be significantly modulated by different inflammatory stimuli. For example, the expression of the caspase genes 1, 2, 3 and 9 is modulated by bacterial infection in the tongue sole, Cynoglossus semilaevis, and has been suggested to play an essential role against bacterial infection . Previous studies also reported the responses of caspase 3 and 6 proteins to viral infection in yellow-striped grunt (Haemulon flavolineatum) GF cells [19, 28] and the response of the caspase 8 gene to bacterial infection in sea bass, Dicentrarchus labrax L. . We therefore examined the effect of inflammatory challenges on JfCaspase gene expression in Japanese flounder immune cells. Figure 4 shows that the gene expression of the initiator JfCaspase 2 was suppressed (by up to 0.6-fold), while the gene expression of the initiator JfCaspase 8 were upregulated by LPS and poly(I:C) treatment (up to 2.8-fold and 2-fold higher than that of control group, respectively) in the HKMs. In addition, the gene expression of the effector JfCaspase 3 in the HKMs was only upregulated approximately 1.8-fold at 24 and 48 h after LPS and poly(I:C) challenge, respectively. However, the gene expression of the effector JfCaspase 6 was upregulated until 24 and 12 h after LPS and poly(I:C) stimulation (by up to 2.2-fold and 3.7-fold, respectively) in the HKMs, respectively. Again, in PBLs, the gene expression of the initiator JfCaspase 2 gene expression was downregulated (up to approximately 0.2-fold lower than that of control group), while initiator JfCaspase 8 gene expression was upregulated (up to approximately 2-fold higher than that of control group) at most time points after LPS stimulation. The gene expression of the effector JfCaspase 3 was downregulated at some time points, while effector JfCaspase 6 gene expression was significantly upregulated (up to approximately 5-fold higher than that of control cells) after LPS treatment in the PBLs (Fig. 5). These opposite expression patterns suggest that a compensatory mechanism may exist, i.e., when the expression of one caspase gene was suppressed, the other caspase gene was upregulated. Interestingly, all four Japanese flounder caspase genes were upregulated upon poly(I:C) stimulation in the PBLs (Fig. 5), suggesting that they may play an active role in response to viral infection. 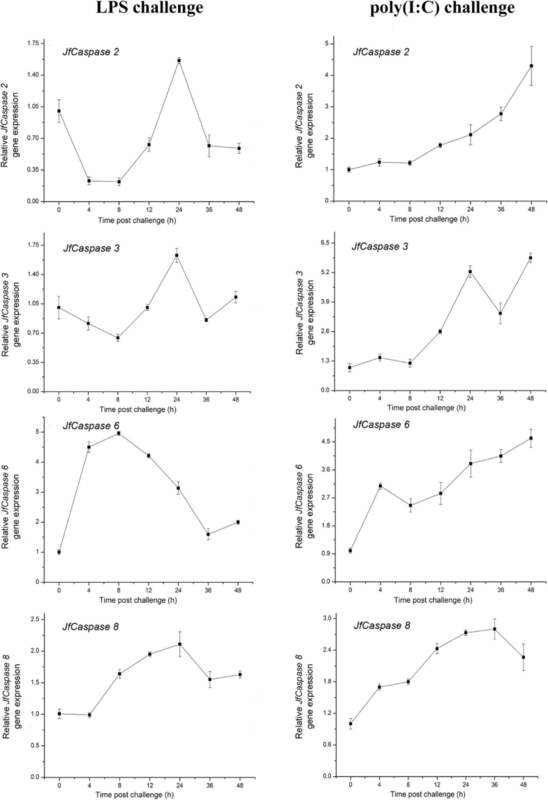 As gene expression changes may not always reflect the expression changes at the protein level, further investigations of the impact of PAMP stimulation on JfCaspase protein expression are needed. The basal gene expression levels of the JfCaspase 2, 3, 6 and 8 genes in HKMs and PBLs without PAMP challenges did not show any significant differences during the experiments (data not shown). Taken together, our findings suggest that the JfCaspase 2, 3, 6 and 8 genes may play a role in the response to bacterial and viral infections in the Japanese flounder, a hypothesis that needs to be clarified in the future. Caspase proteins can be activated by eATP . For example, the activation of the caspase proteins 3 and 8 by eATP was observed in murine macrophages . We previously showed that ATP was released from fish cells into the extracellular milieu during inflammatory stimulation and infection conditions via connexin 43 and or pannexin 1 channels [31–33]. Our previous studies also demonstrated that eATP is a potent signaling molecule in the activation of Japanese flounder innate immunity [20–22]. Specially, we showed that the Japanese flounder ATP-gated P2X7 receptor has an estimated EC50 of 743 ± 299 μM for ATP , and 1 mM ATP treatment can result in profound up-regulation of pro-inflammatory cytokine gene expression, iNOS activity and inflammatory mediators production, including ROS and NO, in Japanese flounder HKMs . Recently, we found that eATP modulates JfCaspase 1 gene expression and enzymatic activity in Japanese flounder immune cells . To examine whether eATP stimulation can affect the expression of other caspase genes, the Japanese flounder HKMs were treated with 1 mM ATP, and the resultant gene expression changes are shown in Fig. 6a. Similar to JfCaspase 1, the JfCaspase 2, 3, 6 and 8 genes were upregulated following ATP treatment although they exhibited different response patterns. Without ATP treatment, the basal gene expression level of JfCaspase 2, 3, 6 and 8 did not show any significant differences during the experiments (data not shown). We next examined the enzymatic activity changes following eATP treatment. As shown in Fig. 6b, eATP treatment broadly upregulated the enzymatic activity of all the JfCaspase proteins in the HKMs. Specifically, the enzymatic activity of the JfCaspase 2 and 3 proteins was increased 12 h after ATP stimulation, while the increased enzymatic activity of the JfCaspase 6 and 8 proteins was observed 24 h after ATP treatment. The enhanced JfCaspase activity may reflect increased apoptosis activity in the HKMs. To test this hypothesis, we performed a DNA fragmentation assay. As shown in Fig. 6c, DNA fragmentation was observed following eATP treatment in the HKMs. However, this eATP-induced DNA fragmentation was inhibited by pre-incubation with the pan-caspase inhibitor Z-VAD-FMK (Fig. 6d). Previous studies have revealed that the caspase 3, 6 and 8 genes play important roles in apoptotic signal pathway in fish [9, 10, 13, 15, 18, 34, 35]. As eATP-induced apoptosis was reported to be mediated by activation of the Caspase 1, 3 and 8 proteins in murine macrophages [29, 30], the above observations thus highlight the important role of eATP in the induction of apoptosis through increases in the gene expression and enzymatic activity of multiple caspase protein family members expressed in Japanese flounder immune cells. Future studies are needed with specific inhibitors to inhibit the enzymatic activity of individual caspase proteins and determine the contributions of the individual caspase proteins to eATP-induced apoptosis in the HKMs. Our findings revealed the different responses of different caspase genes to inflammatory and eATP stimulation in Japanese flounder immune cells and provided new evidence for the involvement of caspase protein(s) in eATP-induced apoptosis in fish. Shuo Li is a senior author. This study was finically supported by the National Natural Science Foundation of China (grant No. 31572645), the Natural Science Foundation of Tianjin (grant No. 18JCZDJC33600), the University Yong Talent Cultivation Program provided by Tianjin Municipal Education Commission, the Science Promotion Program for Young Scholars provided by Tianjin Normal University (grant No. 52XC1503), the Tianjin Development Program for Innovation and Entrepreneurship and the Innovation Team of Tianjin Fisheries Research System (grant NO. ITTFRS2017007). The funders had no role in study design, data collection and analysis, decision to publish, or preparation of the manuscript. Conceived and designed the experiments: SL JS. Performed the experiments: JL WP GH. Analyzed the data: SL JL WP GH. Contributed reagents/materials/analysis tools: SL JS. Wrote the paper: SL. All authors read and approved the final manuscript. All experiments were conducted in accordance with the NIH guidelines for the care and use of experimental animals and these studies were approved by the animal care and use committee of the College of Life Sciences, Tianjin Normal University (#2018–01).